Hardcover, 9.5 x 11 in. / 176 pgs / 103 color / 19 bw. Edited by Christian Schoen. Text by Adam Budak, Söke Dinkla, Alexander Faller, Matthias Mühling, Lupe Núñez-Fernández, Christian Schoen. 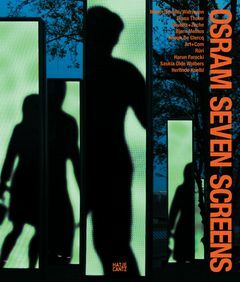 Seven Screens is a rotating platform for public art located at the headquarters of lighting manufacturer OSRAM in the heart of Munich. Osram: Seven Screens surveys the initiative and artist projects by Art+Com, Anouk De Clercq, Harun Farocki, Haubitz + Zoche, Herlinde Koelbl, Mader/Stublic/ Wiermann, Bjørn Melhus, Saskia Olde Wolbers, Rúrí and Diana Thater. FORMAT: Hbk, 9.5 x 11 in. / 176 pgs / 103 color / 19 b&w.